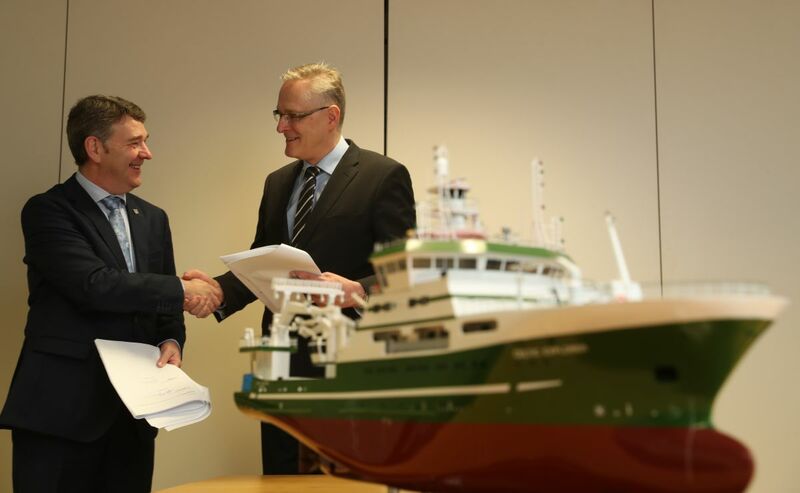 The Marine Institute signs contract with independent ship design consultants Skipsteknisk AS of Ålesund, Norway who have been appointed as the designers of Ireland’s new state of the art marine research vessel. The Marine Institute is pleased to announce the design process of Ireland’s new state of the art marine research vessel is now under way. Following an extensive EU tender process, ship design consultants Skipsteknisk AS of Ålesund, Norway have been awarded the contract to design the new state of the art marine research vessel for Ireland. This is a major milestone with the build process expected to complete in 2022. The new vessel will support Ireland in addressing some of the research challenges of Brexit and the Common Fisheries Policy, as well as climate-induced impacts on our oceans. It will facilitate service demands under the European Maritime Fund including the conservation, management and rebuilding of fish stocks and long-term sustainable harvesting of marine biological resources. According to Minister for Agriculture Food & Marine, Michael Creed TD “There are many challenges posed and threats in relation to our oceans and research is an intrinsic part of formulating a sustainable approach to the use, understanding and management of our oceans. The funding of the new vessel demonstrates the Government’s commitment to expanding and strengthening marine science in Ireland to ensure our nation is equipped with the best scientific advice possible to enable a strong negotiating position and to maximise economic opportunities in a sustainable manner”. Dr Peter Heffernan, CEO of the Marine Institute welcomed the signing of the research vessel design contract stating “The Institute is on track and on budget with the design of the new vessel, which will provide critical national infrastructure and marks a major milestone in the Marine Institute’s efforts to provide world-class marine science. The significantly enhanced capabilities of the new research vessel will help researchers, educators, students and the public gain a richer understanding of our ocean and will facilitate exploration that will lead to discoveries that stretch the bounds of our imagination.